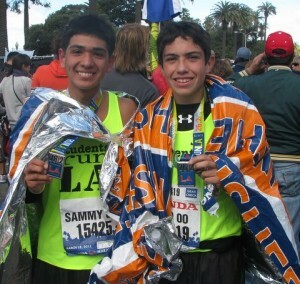 Students Run LA (SRLA) Founder Harry Shabazian ran a marathon and as a result, tens of thousands of at-risk students followed suit. Shabazian’s hunch paid off and these students improved their grades. 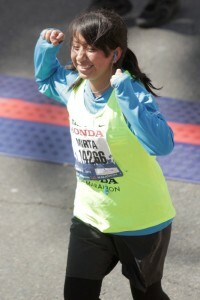 It turns out that training and running can have a positive impact on breaking the cycle of poverty. Now that is something Kars4Kids can get behind and get behind SRLA we did, awarding them a small grant. Kars4Kids: What made SRLA Founder Harry Shabazian think it might help his at-risk students to train with him for a marathon? Naomi Rich: After running his first LA Marathon, Founder Harry Shabazian knew that his students would greatly benefit from the unbelievable feeling of accomplishment. Kars4Kids: Where are those “underachieving” students from that first marathon today? Naomi Rich: Harry keeps in touch with one of his students from the first year he ran with them. He is now 50, a grandfather, a homeowner, married and works on commercial set construction. SRLA alumni have gone on to be successful in a wide variety of fields. Year-after-year 99% of SRLA seniors graduate high school, and 95% of them go on to pursue higher education. Many have become teachers, and this season over 50 of our leaders are SRLA alumni. Kars4Kids: What is the ratio of teacher mentors to students? Naomi Rich: With the support of more than 525 volunteer leaders, the ratio of leaders to students is between 1:7 and 1:5, on average. Kars4Kids: Not quite 3 decades in operation later, SRLA has trained more than 63,000 students. To what do you attribute SRLA’s overwhelming success? Naomi Rich: SRLA’s overwhelming success is due to the amazing group of adult coaches/mentors. Without them, our entire program would not be possible. Kars4Kids: The SRLA website says that students are taught about healthy living. What percentage of the program is spent on healthy living instruction? What kinds of things are the students taught about healthy living? Naomi Rich: SRLA students specifically learn about healthy living from their leaders and online resources. Overall, SRLA’s program is about self-discovery. SRLA students quickly learn what they need to do to have a good run. Students quickly see the benefits of eating a healthier diet, getting enough sleep, and staying hydrated throughout their runs. They also discover the physical and mental benefits of exercise. It’s not about “telling” students what to do but showing them and giving them the chance to find out for themselves. Kars4Kids: What percentage of SRLA participants are from low-income neighborhoods? Do you tend to have a mix of students from various socioeconomic backgrounds in an SRLA group? Naomi Rich: Students Run LA is a school-based program. More than 73% of our students attend schools where 80% or more of the student population qualifies for the reduced/free meal program. In addition, mapping students’ addresses against federal census data, 70% of SRLA students in Los Angeles County live in areas where the median household income is less than $47,307. At the schools the program is offered, Students Run LA is open to students of all backgrounds, and we strive to provide opportunities for students that need it the most. The only requirement to join SRLA is passing a medical clearance to ensure safe participation. Kars4Kids: How many hours a week must a student devote to SRLA? Has it ever happened that a student’s grades suffer as a result of participation in SRLA? Naomi Rich: Students Run LA is on 182 schools across the greater Los Angeles area. Each school has a team of volunteer leaders that work together to create their team’s training plan. Students typically practice between three and five days a week and participate in runs that properly prepare them to run 26.2 miles at the Skechers Performance Los Angeles Marathon in March. Our schools come together once a month for a training race (5K, 10K, 15K, two half marathons, and an 18-mile race) as a part of their journey to the Marathon. These races prepare our students for the big day, but also teach our students about goal setting. The academics of SRLA students improve, not suffer, from their participating in SRLA. For the past several years, SRLA has participated in a study that tracks SRLA students’ grades year over year. Most recently, at the end of our 2016-2017 season, 47% of those students improved their grades while another 14% maintained their grades, with an average GPA of 3.48. Kars4Kids: How does a student qualify for an SRLA post-secondary education scholarship? 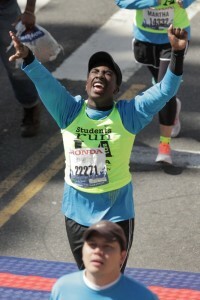 Naomi Rich: To apply for a SRLA post-secondary education scholarship, a SRLA student must complete the Skechers Performance Los Angeles Marathon the year of their graduation and submit an application. The application includes, among other things, submitting a transcript, two recommendations, and two essays describing the impact of SRLA. Kars4Kids: Is Harry Shabazian still active in SRLA? Naomi Rich: Harry Shabazian, as well as co-founders Paul Trapani and Eric Spears, are still active in Students Run LA. Kars4Kids: What’s next for SRLA? Naomi Rich: SRLA is always seeking to improve and strengthen its program. Recently, SRLA added a community service component to its program under the umbrella of SRLA cares. SRLA Cares raises social, environmental, and community awareness through various community projects and provides an opportunity for SRLA students to give back to their communities. SRLA Cares was developed to further the depth of character development in our runners and enhance the overall experience of SRLA. Science Camps of America: "I Guess They Learned Something"